This week, the Sunday Supper team is partnering up with Chantal Cookware and a lucky 20 ladies were selected to receive their new Easy as Pie Dish. The whole point? We’re baking in honour of those who have been affected by the scourge that is cancer and unfortunately, there are too many of us who can lay claim to that dishonour. I have known and loved too many people directly affected by this disease. There was one terrible year where I went to four funerals and in each case, the deceased had succumbed to some form of cancer. I definitely wanted to take part this week and bake something in recognition of all the strong, tenacious, inspirational people who are dealing with this on a day to day basis. I’m bringing bread to our virtual table. Bread is old school. It’s calming. It’s soothing. It’s something you make in a manner that is almost primal – the way that a few scant ingredients come together in your hands and becomes something so comforting and familiar. 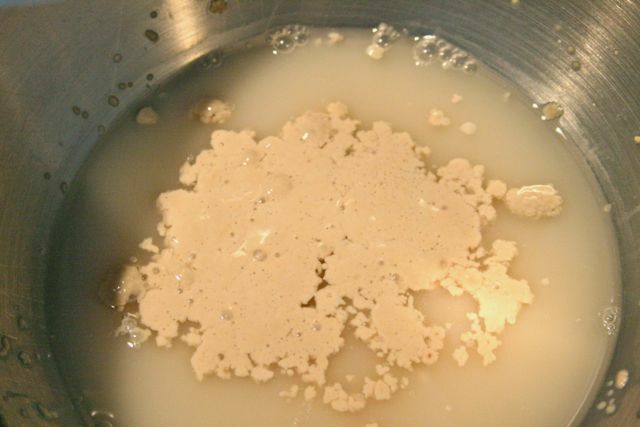 In the bowl of stand mixer fitted with the paddle attachment, stir together the yeast and warm water. Let it sit for three to five minutes and watch it bloom (very cool). 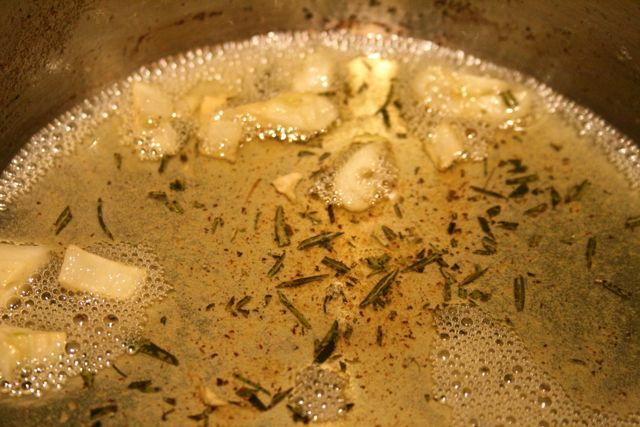 Add the honey, oil, salt, egg, garlic and rosemary to the yeast mixture and mix well. Add three cups of flour and mix until the dough comes together. It will be very sticky. 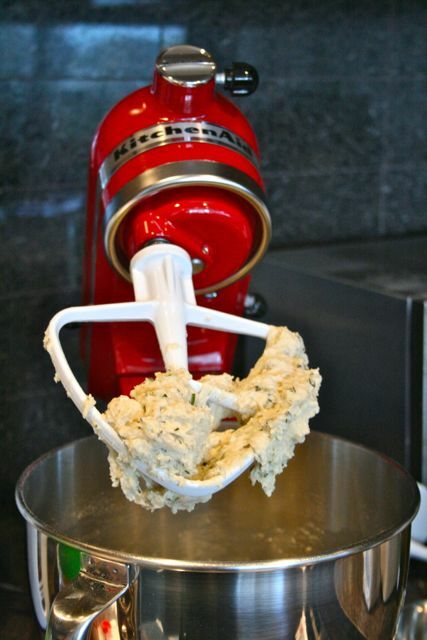 Switch to the dough hook and with the mixer on low/medium-low, add in the remaining cup of flour. The star and heart of my kitchen – my Kitchenaid Mixer. Continue kneading on low-speed for 8-10 minutes, until the dough is smooth and elastic. 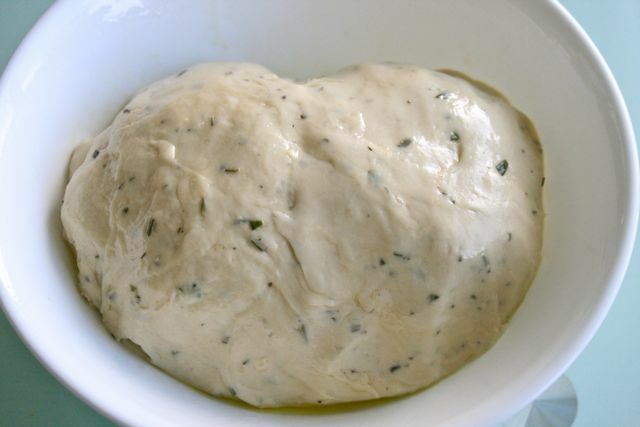 If your dough is too dry and isn’t coming together, add a bit of warm water, a tablespoon at a time. I had to add in about 2 extra tablespoons to get my dought to the right consistency. 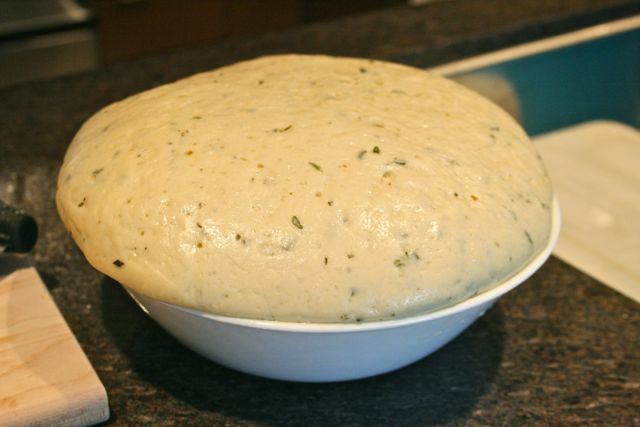 Transfer the dough to a lightly oiled bowl. Turn it once in the bowl to coat it on all sides. 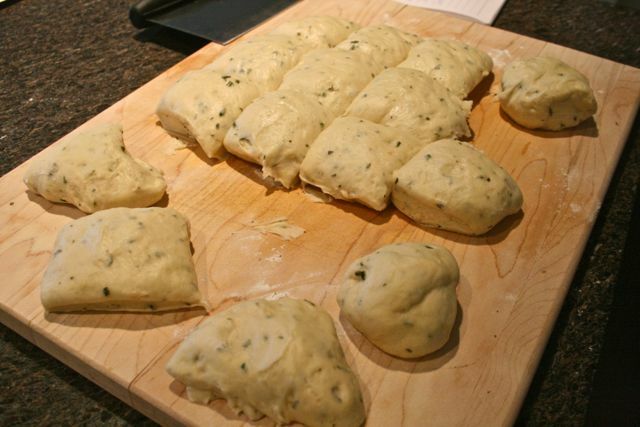 Cover the dough with plastic wrap or a clean kitchen towel. Place the bowl in a warm, draft-free spot for about 2 hours until it’s doubled in size. Turn the dough out on a lightly floured work space and knead for about 30 seconds. 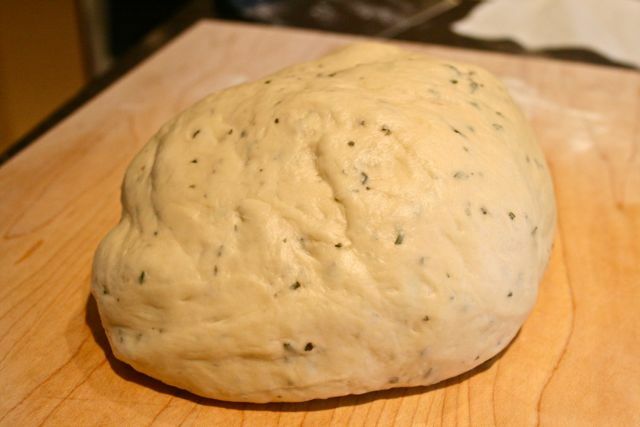 Cover the dough again and let it rest for another 10 minutes. 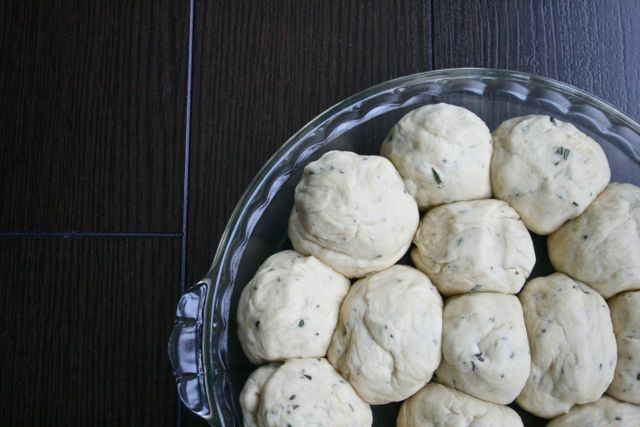 Punch the dough (so fun!) and divide it into 10-12 equal sized pieces. 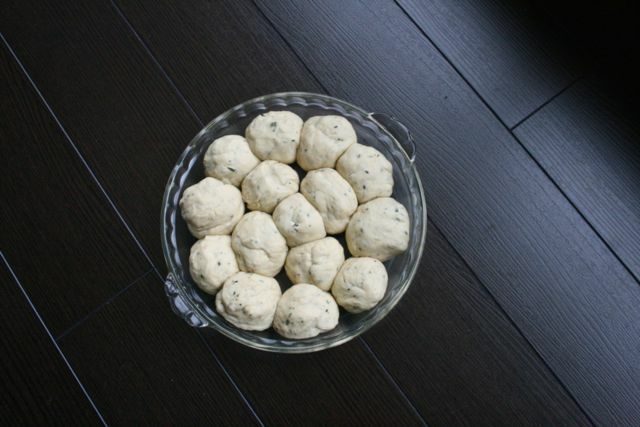 Roll each piece into a ball and place it into a greased dish. I made 12 pieces and they all fit into a normal sized Pyrex pie plate. Cover the pie plate and let the dough rise in a warm, draft-free spot for about 20-30 minutes. 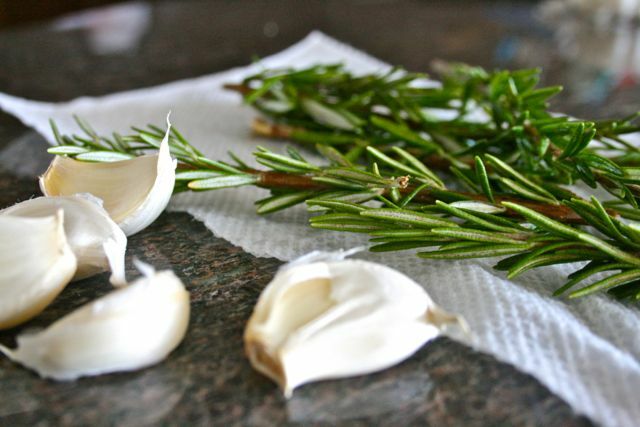 During the final resting period, preheat your oven to 400 degrees F.
Place the two tablespoons butter, garlic and rosemary (however much you want) into a small saucepan. Heat it over medium high heat until the butter has melted. 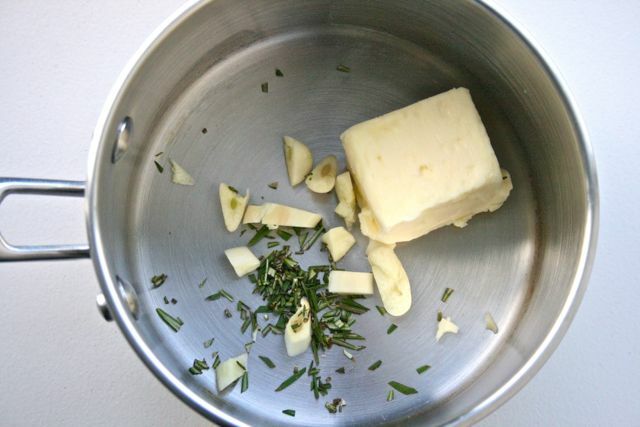 Continue heating on medium heat for about 2 minutes to really infuse the butter with the garlic and rosemary flavour. 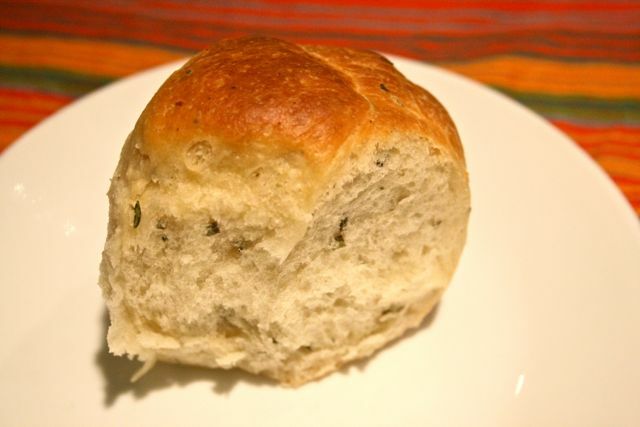 Brush the melted butter over the top of the unbaked rolls. 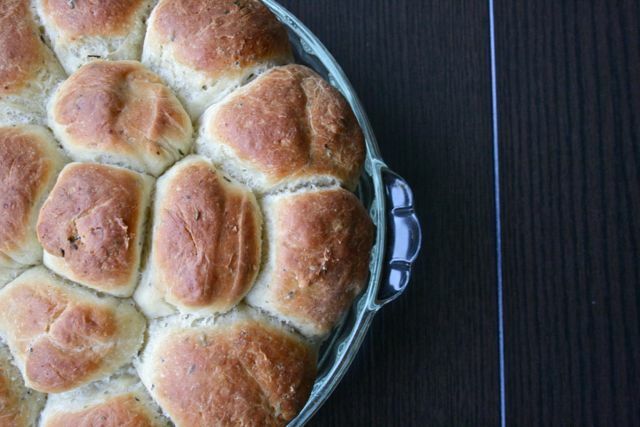 Place the rolls into the oven and bake for approximately 15-20 minutes. The missing piece. It was in my belly. These are absolutely delicious. I don’t know why I was ever intimidated by bread baking at home. The tops were crusty and the insides soft, fluffy, and intoxicating with the strong garlic and rosemary flavours. The Husband inhaled two of these right away. Me – I can never stay away from carbs and it was hard to stop myself at just one piece. Each Sunday Supper participant this week is bringing their baked dish to someone dealing with cancer, whether they’re a patient, a love done, or a health professional who works with cancer patients. 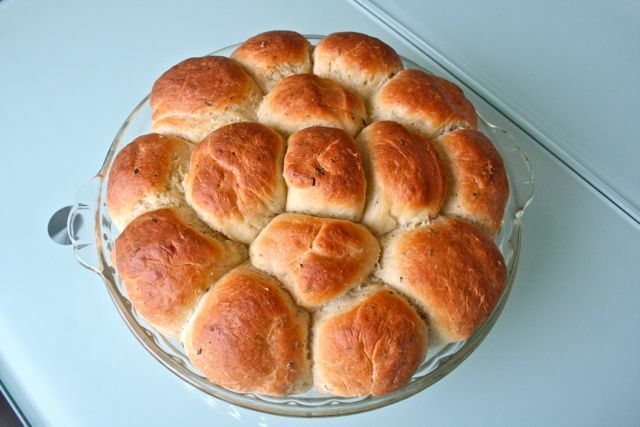 I wanted to bring some rolls to my sister-in-law, who is a fantastic nurse. She is an incredibly strong, competent, able woman who I would gladly have in the hospital room with me. She doesn’t work specifically with cancer patients but she does a job that I could never imagine doing. It takes a tough person and trust me, she is one! Unfortunately, I didn’t have time to drop by her place so I’ll give some to my Lil Sis tonight. My Lil Sis is a dietitian who works in hospitals, sometimes with those dealing with cancer. 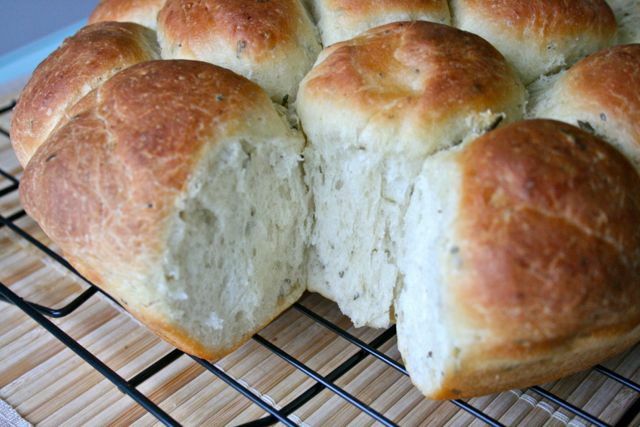 I’m sure she’ll appreciate these soft, garlicky, savoury rolls. The rest of us wanted to bake along in honour of this solemn and important occasion. Chantal is offering 20% OFF of ALL Chantal Pie dishes on www.chantal.com. BAKE4CURE must be entered at checkout to receive the pie dish discount. The coupon discount code is active October 16, 2012 through October 30, 2012. (Coupon only available to US residents – apologies to my Canadian peeps!). Join the Sunday Supper Team and Chantal Cookware for this special #BakeForACure event Around the Family Table this week on Twitter throughout the day during #SundaySupper. We’ll be meeting up at 7:00 pm (Eastern) for our weekly #SundaySupper live chat. Just follow the #SundaySupper hashtag or you can follow us through TweetChat.